A late breakfast today, with slow-cooked hickory-smoked bacon – or thinly-sliced pork belly if you don’t call this bacon – homemade buttermilk waffles, and a couple of eggs over easy. The remaining waffles will freeze nicely – about four times nicer than supermarket frozen waffles, in fact. 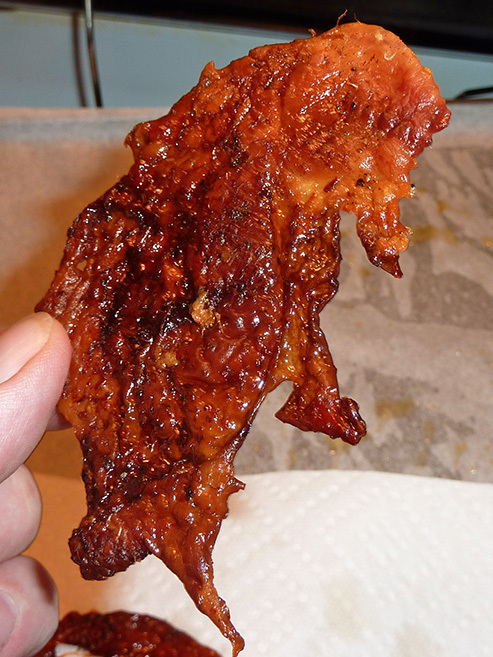 With a little experimentation some years ago, I determined that this is the best way to slow-cook bacon: Preheat your oven to 275-285 F (135-140 C). The reason for that temperature? Not just to go slowly, but because the curing salts used in bacon production begin turning bitter at about 300F/150C. Line a large sheet pan with aluminum foil, taking care not to rip it or get holes in it (for easy cleanup). Put a fairly close-mesh wire rack in the sheet pan, then place your rashers on the rack in a single layer, just touching each other. 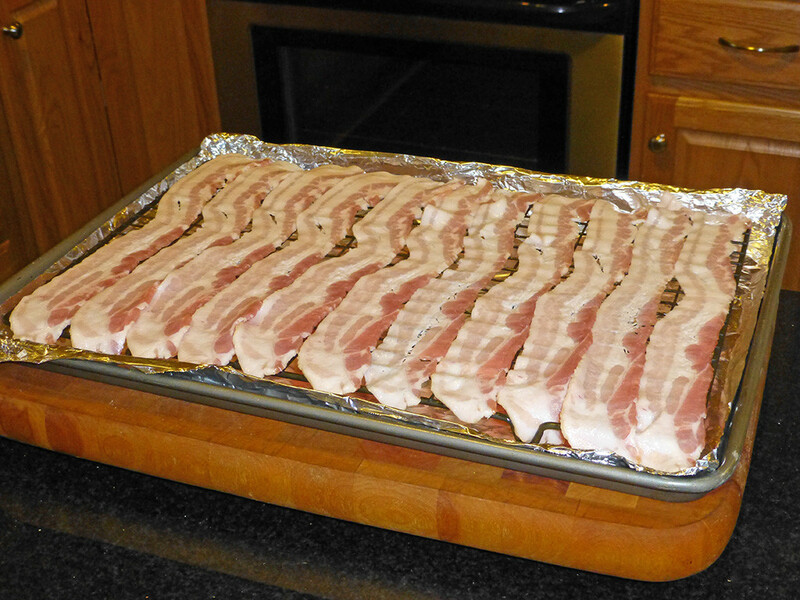 A half-sheet pan will hold about 3/4 lb, 1/3 kilo, or 11-16 rashers of regular cut depending on their width, which varies considerably from package to package. You can cook more than you need, because these will reheat very nicely with 30 seconds in a microwave. 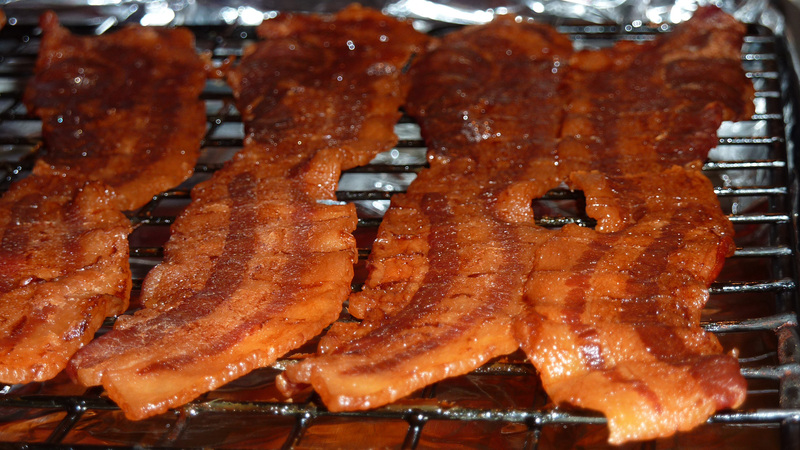 I use a regular (not thick) cut, cured, hickory-smoked bacon for this method; smoked or not is a personal preference, but I’ve found uncured bacon doesn’t work as well. Now, slow-bake it for 90 minutes – yes, 90 minutes. (Because bacons vary considerably, you should start taking a look at the 75 minute mark and maybe every 5 minutes thereafter so it doesn’t get too dark. I also look at the wetness: When the rashers start to look not completely dry but more dry than wet, they’re perfectly done.) What happens is magical. You end up with slices that are about 90% of their original size and about one-fifth of their original weight, and about a half-cup of perfectly clear bacon drippings in the (lined) pan. The bacon is a deep color with no burned parts at all, has very little grease (it’s all in the pan), and absolutely melts in your mouth. In fact, the cooked bacon is so delicate and wafer-like that some pieces will probably break in two from their own weight when you remove them from the rack to paper towels to drain. The best part is that the bacon is now reduced to almost pure flavour, and it will be the most intense bacon flavour you are ever likely to encounter. 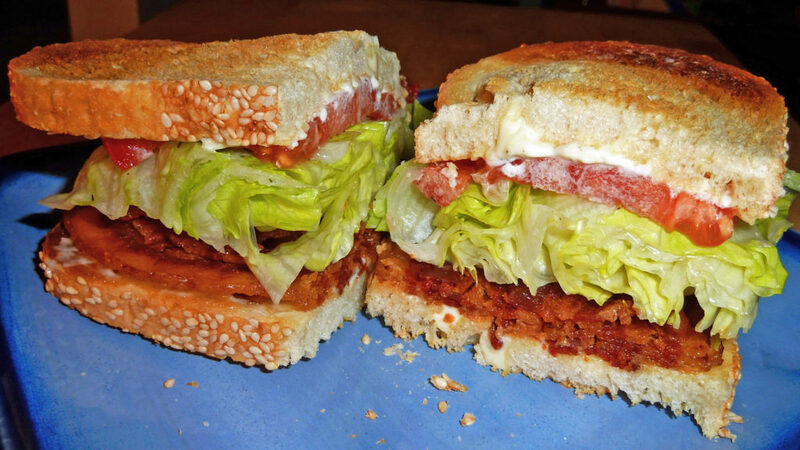 It may be difficult to restrain yourself and actually make the rest of your breakfast or BLTs instead of scarfing down the whole lot straight out of the oven. It’s also probably a bit healthier for you, since 80% (or so) of the fat is gone and sitting in the pan. You can bake chicken skin in a similar low-and-slow manner, but between layers of parchment paper, with a second pan sitting on top to keep it flat. 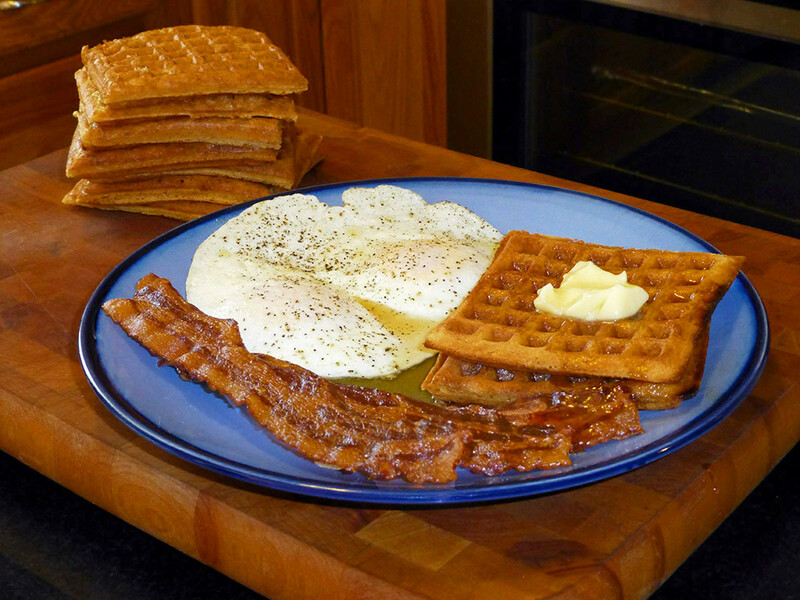 This entry was posted in Cooking, Recipes and tagged buttermilk waffles, slow-cooked bacon. Total Yum that Sunday b’fast. Ever tried this “pork belly” variation? W red chile powder and brown sugar ? Then I’d cook ’em more or less the way you did. You can freeze these too. 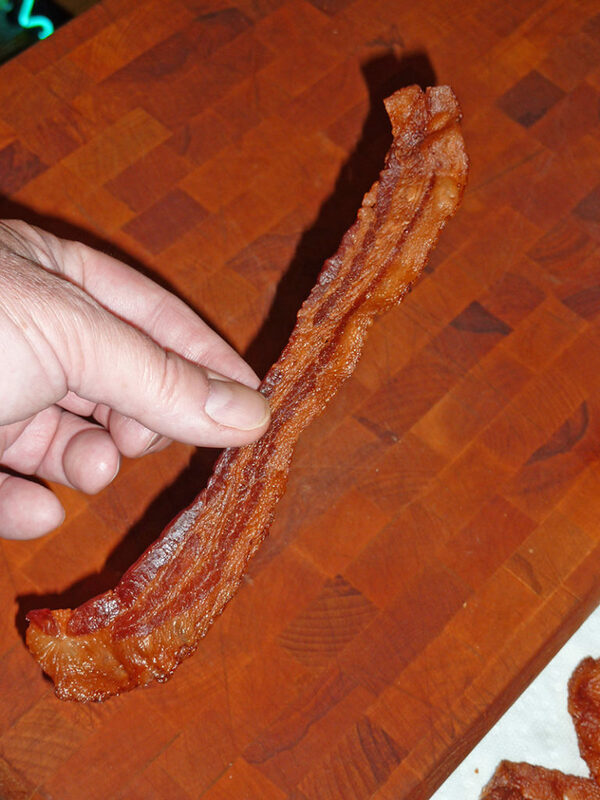 I recently discussed the baked bacon method with a fast food chef I know. He immediately poo-pooed the idea, claiming that the bacon loses flavor by that method. I didn’t want to argue with him, but I’ll note that few home cooks have a large griddle on which to fry their bacon, and few fast food chefs have an oven available where they can bake their bacon in the quantities necessary for their operation. Moot point? Perhaps, but Lalmon wins in my home recipes. They also don’t have 90 minutes for such tomfoolery, generally speaking. 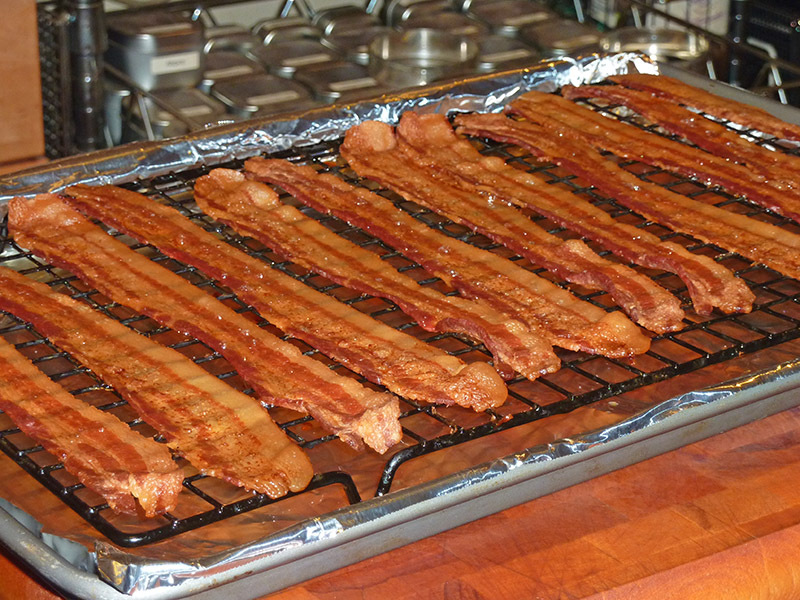 For that reason, restaurants that do oven-cook bacon in quantity tend to do it at a higher temperature and in direct contact with the sheet pan. However, anything over 300F/150C will start producing some bitter compounds from the curing salts. Cooking bacon at, say, halfway between medium and medium-high heat in a pan on the stovetop will easily exceed 400F/200C. He may have that idea from fat=flavour, nearly always true, but I’ve used the perfectly clear fat in the sheet pan to cook eggs with, and it doesn’t add much to the party – a bit odd because I remember that it used to add a good bacon hit to over-easy eggs when I was a kid and my mother saved bacon grease for that – but she used a frying pan at medium or medium-high heat, where a good amount of flavour must have been leeching out into the pan with the fat. For that reason, I believe nearly all the flavour’s staying on top of that rack at the lower temp. In any case, as I’ve mentioned, bacon cooked this way is the baconiest I’ve tasted. That’s all I need to know, and with that I rest my case.